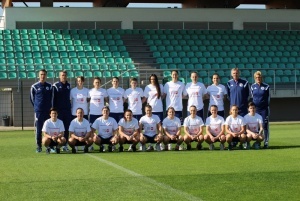 Sarajevo/Zenica, 12 April 2016 - Bosnia and Herzegovina’s women’s football team will play one of the most important matches today in Zenica, against England national team, one of the best in the world. ince football is seen as men’s sport, particularly in Bosnia and Herzegovina, UNFPA joined in support of women football players in order to break-down gender stereotypes, improve girls’ and women’s self-esteem and contribute to their overall health. The women’s team posed for picture wearing UNFPA’s t-shirts with a slogan: Choices not Chance! The manager of the Bosnia and Herzegovina women’s team Samira Hurem stated: "The amount of support that came from this campaign is incredible and it is certainly a big support for our players who will be today on the field to compete against the national team of England. I hope that we have been able to show that women in football deserve the same support for their game as much as men counterparts. Women's football is on the rise and Bosnia and Herzegovina, as a country, certainly has its potential." Football can provide a path to better health outcomes, and ultimately transform gendered perceptions leading to a more egalitarian world and set free the intellectual and social power of women. “Personal fulfillment in sport is very important and in order to practice sports, a woman must be master of her body, must be free and empowered to make her own, informed choices in life, including her reproductive rights”, said Doina Bologa, UNFPA Representative in BiH. During the match some 100 fans, both man and women, will be wearing UNFPA t-shirts.